Dujiangyan, Sichuan -- Zhou Xingrong never thought she would not talk to her 16-year-old son again after Lu Qianliang shouted: "Mother, I'm in school!" on the Monday morning. But after a 7.8-magnitude earthquake on Monday with its epicenter near here, many students like Lu were still buried beneath the rubble early Tuesday morning due to the collapsed main building of the Juyuan Middle School in Juyuan county, east of Dujiangyan. The city is one of the most severely damaged by the quake. As the time passed, the hope for those students to come out alive was getting more and more slim. 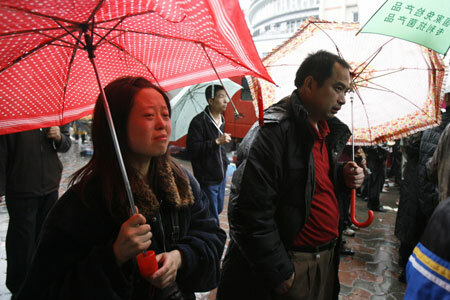 But their parents could do nothing more than stand in the heavy downpour in dark and pray for their loved ones. Zhou was one of those frustrated parents. She was also in the main building meeting with her son's head teacher when the ground shook. 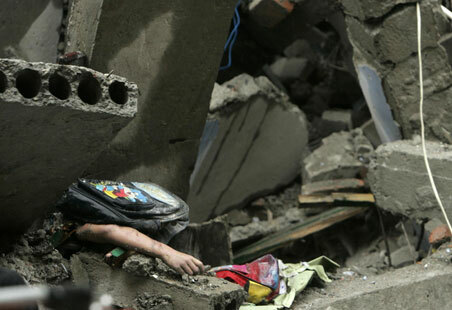 She managed to escape from the collapsed building because she was closer to the staircase than her son. "I rushed out of the building onto the sports ground from the stairs when there was a very loud noise. When I turned back, the whole building had collapsed," she said. "But my son is still buried in the rubble and 14 hours have passed." "He is in the final year and will soon graduate from middle school," explained the 53-year-old, who could barely contain her sadness and frustration when she talked to China Daily at about 4:30 am on Tuesday. Not everyone in the building managed to escape from the disaster as Zhou did. Local residents said more than 1,000 students and teachers were having classes in the school at that time. Except for those students on the ground floor who rushed out immediately, it seems most of the others from the upper floors of the four-storey building may have lost their lives. The sports ground has been turned into a makeshift memorial area, as about 50 bodies, most of them covered with white cloths, were placed in rows under a big tent. Heartbroken parents lit candles in front of the bodies of their sons and daughters. Many of them were crying out their regret for letting their children to come to the school. They prayed for forgiveness as their eyes were flooded with tears. "It's my fault, my baby. I shouldn't have let you come to this school," a mother cried while wiping away the blood from the corpse of her daughter. "I sent you here to get education, but what you get was death," the woman wailed. Rescue work continued with the hopes of finding someone alive, despite knowing the chances were slim. Medical teams and ambulances from all over Sichuan Province arrived in Dujiangyan, some even coming from Chongqing. The rescue teams that went in search of life among the debris were also from different parts of the province. A local rescue team member said he saved a life, though they found far more dead bodies. "We carried an injured boy with a broken leg out of the rubble," recalled rescuer Xue Cangming from the National Grid's Dujiangyan bureau. "I believed he jumped out of the window when the building collapsed. "But he is considered really lucky even you could see his bone sticking out of his leg, considering most of the trapped are feared died," he added. Xue reported he had found six to seven bodies since he arrived at the school at about 2:45 am.